Get the most from your Solarwinds Log & Event Manager investment. 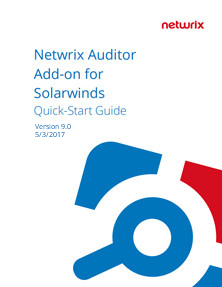 Integrate Netwrix Auditor with Solarwinds Log & Event Manager through the RESTful API with this free add-on. Enrich your Solarwinds Log & Event Manager output data with actionable context in human-readable format, including the before and after values for every change and data access attempt, both failed and successful. Actionable audit data enables you to investigate what steps led to an incident so you can better determine how to prevent such issues from happening again. AuditAssurance™ technology turns disparate arrays of logs into a single record. Then Netwrix Auditor feeds Solarwinds Log & Event Manager with this granular data, reducing the volume of indexed data and making your SIEM more cost effective. Review detailed instructions for installing the Add-on for Solarwinds Log & Event Manager. Learn how to configure it properly.